Mass Coral Bleaching, a case of starvation? Where does this fit in the longer-term picture? And how ominous a sign is this really? Might it be just part of a natural cycle, a thing that corals have survived many times before? 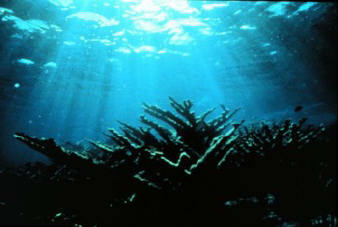 ...what do we know about the history of life on coral reefs? A key question to be answered is “has mass coral bleaching occurred before, or is this truly a new phenomenon?” How far can we look back and what is revealed by the history of the reefs? There are some accessible records, and scientific investigations have revealed that the current global pattern of “mass coral bleaching events” on the reefs has never happened before. On a shorter time frame, scientific work has revealed recent patterns in growth rates of corals. Growth rates can be affected by many variables (temperature being an obvious one, and the usual trend is for organisms like corals is to grow more quickly at higher water temperatures), but one undeniable variable that also affects growth rate, is feeding success. It is not clear that this factor has been adequately considered in the explanations given for the coral growth trends that have been discovered. A growth rate decline in corals has occurred over the last 50 years, and it is clearly NOT associated with a cooling climate trend? Has is been caused by an OVERSUPPLY of nutrients? It is difficult to see how these particular Floridian reefs could have been so damaged by sewage outfalls, how they might have been subjected to anything more than a very slight nutrient enhancement (if that). The study was conducted in Biscayne National Park, a relatively pristine area described as having water that is “refreshingly clean, extraordinarily clear. Only the maintenance of the natural interplay between the mainland, Biscayne Bay, keys, reefs and the Florida Straits keeps it that way.” (park website) Located south of Miami, and including a long protected coastline, it seems that the natural effect of the Gulf Stream would be to move “nutrients from sewage outfalls” away from this large national park. The keys and reefs are located 10 miles or more from the also-protected mainland coast. The park is described as very “clean” and apparently it is a very popular location for recreational fishing. While it still contains fish, significant quantities of fish biomass have doubtless been removed from the Biscayne Park reefs in the centuries since humans arrived, allowing for the distinct possibility that the decline in the growth rate of coral there may be related to fishing-induced nutrient depletion of the system. The argument about whether or not enhanced nutrient runoff into the sea is affecting offshore reefs and causing the decline - or not - is very significant. Because if the nutrients are NOT getting there, then they are NOT having any deleterious effect, and the 50 year decline in the growth rate of corals is due to some other factor (...possibly the fact that the nutrients are NOT getting there?). The half century of slowing growth may just have been the preamble to todays crisis, corals with weakened immune systems suffering from epidemics of infectious disease, mass coral bleaching and death. Could the decades of slowed growth and ultimate sickness and death now be telling the tale of an insidious, gradually worsening condition -- of malnutrition due to fishing induced nutrient depletion of the reefs in particular and the open ocean in general? Still...nutrient depletion in the sea is one hypothesis that needs to be seriously investigated at this point if we ever hope to understand these critical problems. A perturbation so severe that it has seriously altered the nature of “stable oceanic open waters?” ...a development that is unprecedented in long historical records? Also, it seems that the whole “mass coral bleaching” problem has taken scientists completely by surprise. No-one anticipated this problem. Scientific books and papers on corals before the early-mid 1980s make no mention of it, seemingly it just did not exist; it was never seen anywhere. Even now, in a current up-to-date book on coral reef fisheries, (Reef Fisheries, Polunin and Callum (eds) 1996) none of the contributors make mention of mass coral bleaching in their discussion of all the issues facing reef fisheries. This reluctance or inability to look at the whole picture is seriously handicapping our efforts to understand the changes in marine ecosystems. Also, along the same line, our natural reluctance to really objectively consider the whole extent of the negative impacts that fishing has had on marine life....this also prevents us from seeing the picture clearly. We need to face up to the true history of fishing...and somehow overcome our habitual and sentimental attachment to it. We cannot find the holy grail of “sustainability” because it simply doesn’t exist using out current approach. We essentially give nothing useful back to the sea. “Sustainable” fisheries in the past were undertakings that persisted for many years, seemingly without depletion of resources, but the reason that they appeared this way was because they were relatively light exploitation applied to a very rich resource (for example, subsistence fisheries by native peoples). The dents were perhaps too small to notice? Actually, historical records of commercial fisheries going back for centuries are full of reports of “declining resources.” The story of the history of fishing and whaling actually tells repeatedly of exploitation leading to depletion (the first dramatic examples being the marine mammals, whales and walruses, the seabirds and the turtles), then the human hunters moved on to new fishing grounds, or new target species, and the same sequence of events unfolded again, over and over. The total “resource” was always dropping to lower levels in the background. For many years, it was possible to increase overall fishing yields due to increasing effort and constant advances in technology, which greatly increased the efficiency of the fishermen. These factors effectively obscured the background theme, the thing that we are so afraid to acknowledge, the steady decline in the total available resources. => THIS IS NEW, AND IT’S A TRULY OMINOUS SIGN. => IT IS NOT PART OF A “NORMAL” CYCLE, NOR IS IT A SIMPLE REFLECTION OF CHANGING TEMPERATURES. => BEST GUESS: “FISHING” HAS “SOMETHING” TO DO WITH THIS PROBLEM. We will have only one chance to establish the correct diagnosis, and there is clearly not a lot of time to be wasted, considering the rate at which corals are being lost. It may be later than we think.